Your summer sipping just got a little bubblier! 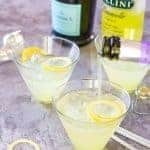 My 3 ingredient Limoncello Lady is tart, dry, and perfect for any afternoon sipping situation. Slice your lemons for your garnish. Combine the limoncello and lemonade in a glass. When ready to serve, top with prosecco. Garnish with lemon slice or twist.